The Krakow IT market is by far dominated by large international corporations. They employ at least 15 000 engineers here, and this number grows by at least 5% annually. There is also a growing number of Polish tech firms in Kraków. Some of them are young start-ups, with over 100 of them in the city. Another group, and this is going to be the focus of our article, are the Polish software houses in Kraków. At least 2 000 engineers work for Polish software houses in Krakow. Also, we have decided to only look at software houses that work internationally and are Polish. By our subjective standards a company qualifies as being Polish if it has at least 25% Polish capital and at least 50% of the workforce are situated in Poland. To assess the size of the team in Kraków we used LinkedIn data. Yes, in some cases LinkedIn data can show figures that are as much as 20-40% lower than the actual number of employees. We assumed that this gap is comparable between companies. There are at least 70 software houses in Kraków that meet our criteria. At least 30% of them are small firms that employ up to 10 people. Another 30% of them are those that have a range between 10 and 30 employees. These small ones often started as an initiative of a couple of friends who found a client for their services. Some of the largest ones grew as staff augmentation providers for big players in the Kraków market like Sabre or ABB. The majority of small software houses specialize in Web and Mobile apps. They build websites, web applications and mobile applications to clients’ specific requirements. Only a handful of software houses specialize in some specific technologies, like Virtus Labs (Scala) or domains and industries like Ailleron (telco, fintech, hospitality). Relatively few of the software houses will work using the Microsoft stack, with most of the companies specializing in Java, Node.js, Python, PHP, Ruby, or similar on the back end, and Angular or React on the front end, plus the mobile apps. All of the software houses try to follow agile practices, with some of them like Lunar Logic being particularly focused on having best-in-class processes. The last several years saw a growing trend of mergers and acquisitions. Here are some of the recent transactions. For most of the acquisitions, the values were not disclosed, except for Grand Parade, which was acquired for approximately 15M EUR. This trend is going to continue for several reasons. First, the market is consolidating with the aim to identify some dominant players. Second, IT consulting firms from outside of Poland are looking for ways to save time that they would normally spend on growing organically and decide to acquire local players with experience. The third reason is that companies that find it difficult to grow teams quickly (internal capacity to grow organically, challenges in recruitment) decide to expand by merging with smaller companies. 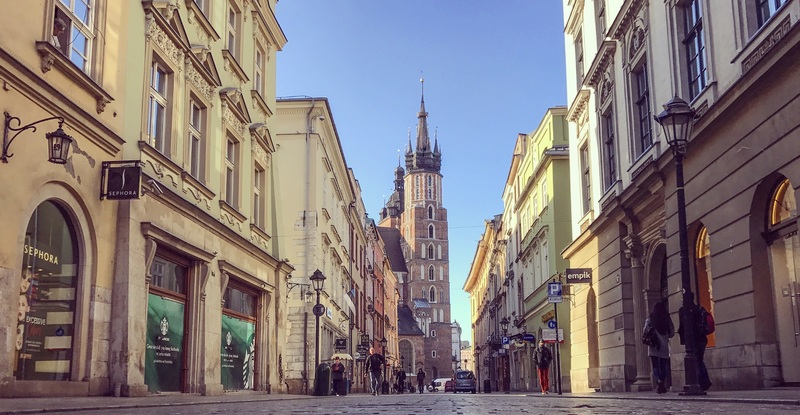 The technical proficiency and Kraków’s large talent pool are the two key factors that remain the key strengths of software houses in Kraków. Clients appreciate the quality of the work done, the good organization of projects and the proficiency in communication. Most of the teams are young and vibrant, which, to many organizations that outsource can be a refreshing experience. Also, Poland, ranking very high in English proficiency (11th according to the EF English Proficiency Index (EF EPI)), makes it easy for teams to work internationally. The cost remains to be an important factor; however, what really matters is the value. The perceived team quality, the overall results of projects, and the standards in communication are quite high comparing to other locations in CEE countries or Asia. We’re Polish, so it should come as no surprise that we include more challenges than strengths here. Please take it with a grain of salt and consider it to be an entirely subjective view. Let’s start with saying that being a body leasing shop is not the best strategy for the city, if it wants to stay competitive internationally. In the end, if you need a generic software developer for a temporary assignment, it really matters less where the person is located. The real value is delivered when a software house can compete as a solution provider that builds an end-to-end solution based on the client’s needs. This would involve requirements analysis, project management, QA, internal integration processes. This would also allow companies to foster more senior roles with project management skills in software houses. Otherwise firms primarily employ engineers that do the tech job and the project is managed by the clients. Another challenge is the decreasing salary gap. As much as Kraków remains competitive compared to the UK, Switzerland, Scandinavia or Silicon Valley, there are locations in Europe where wages are not that different from the wages in Kraków anymore. Still, the ability to recruit and retain quality engineers continues to be a huge advantage of Kraków. The majority of software houses in Kraków specialize in Mobile and Web projects. As much as these areas are in the epicenter of the technology world today, what pays more and brings more value is to specialize in specific technologies or industries to offer a higher-value service. Focusing on specific domains would allow firms to build functional skills in specific industries. Kraków software houses only recently started building their sales capacity to be able to increase the volume of their international sales. They open offices in the UK, the Netherlands, Sweden, Germany or the U.S. to attract new clients. They build sales teams that are able to talk to client abroad. Approximately 1 000 engineers work for the 10 largest software houses in Kraków. Interestingly enough almost all of these companies were created in the last 10 years, which means they have very young teams. On average these firms grew by approximately 15 engineers each year in the last 6-7 years. With our criteria to include only firms with some Polish capital, we had to remove u2i (http://www.u2i.com) from the list, which is owned by a UK entity as well as some large players like Epam (http://www.epam.com/), which has over 500 employees in Kraków, Luxoft (https://www.luxoft.com/) with over 1 500 people and SII (https://sii.pl/), which is a French-owned company. For the purpose of this analysis, we are not going to include traditional system integrators like Qumak or Sygnity, which have offices in Kraków as they primarily focus on implementing third party software. It is staggering to learn that Luxoft employs as many engineers in Kraków as all the Polish-owned software houses in Kraków combined. It appears it is much easier for large companies like Luxoft to offer competitive salaries and packages, possibly more interesting projects and more opportunities to grow. It is, however, in the small and medium software houses where the diversity can flourish and local entrepreneurship can grow. They can offer a real startup-like environment and a more agile organization and processes. The difficulty is in the ability to acquire large clients for bigger, long-lasting projects. Without having this capability, the firms remain relatively small. Seeing the incredible growth of the market in the last 10 years, we can assume the trend is going to continue with more new software houses popping up and existing ones growing at a relatively fast pace. Finally, it would be a significant contribution to the Kraków IT market if large software firms present here in the city would work more with smaller software houses from Kraków, not only in the body-leasing mode, but to actually delegate complete software projects. If you are looking for information about setting up your presence in Poland, download our Kraków IT Market Report 2018. If you are interested in alternatives to outsourcing, contact us at MOTIFE to learn more. If you enjoyed this article, please like, share and follow us on social media. This helps us reach more people and grow our business . Michał Piątkowski is an R&D and Product Management leader, software professional and co-founder at MOTIFE - a Kraków based IT advisory and consultancy firm.